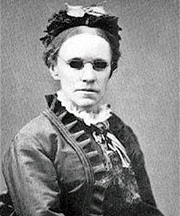 Fanny J. Crosby (born March 24, 1820, died 1915) was the prolific blind hymn-writer who captured the ethos of late nineteenth-century evangelicalism and set it to music. We had to wait until just a few years ago for a substantive critical biography of Crosby: In 2005, Edith L. Blumhofer published Her Heart Can See: The Life and Hymns of Fanny J. Crosby. It’s an exemplary work of scholarly reconstruction, sifting the primary sources, sorting out the legendary elements, and handling the evidence transparently so the reader doesn’t have to just take the historian’s word for it. For some idea of how hard Blumhofer’s task was, consider the second appendix, which provides “A Partial List of Fanny Crosby Pseudonyms.” Though the list approaches 200 pen names (from Alice Armstrong to W. Tidings, including Robert Bruce, Frank Gould, Emily Prentiss and “Children’s Friend” along the way), Blumhofer conscientiously notes that it is “partial,” because there was no keeping up with Fanny Crosby and no way of knowing when you’ve exhausted the historical record she left. Why so many pseudonyms? Though there may have been gender-related reasons (and Blumhofer is keenly sensitive to gender issues in this story, without overplaying them), the main reason her publishers resorted to pen names was to deflect attention from Crosby’s sheer productivity. I doubt we can know how many hymns and gospel songs Crosby actually wrote, but the best number to toss around seems to be 9,000. No one made a serious case for Crosby lyrics as ‘serious’ hymns. Rather, her lyrics were ‘singable,’ ‘catchy in the best sense of the word,’ and their resonance with grassroots realities assured that they would be remembered and sung long after ‘more ambitious poems’ had been forgotten. Her contemporaries did not expect to find her lines in books printed without notes and designed for devotional reading; few, they admitted ‘will achieve poetic immortality.’ Instead, her words were emphatically for singing, and the simplicity, sentiment, ‘galloping,’ and repetitiveness that critics found offensive were the precise elements that charmed the masses. These are songs that have weathered numerous changes in musical sensibility, crossed denominational boundaries, and established themselves as a legacy from American victorian Christianity to the history of the world. Crosby’s greatest hits during her lifetime, songs like “Safe in the Arms of Jesus” and “Hold Thou my Hand, So Weak am I and Helpless,” have not worn quite as well. One of the chief merits of Her Heart Can See is that Edith Blumhofer is such a reliable guide through the intricacies of that vanished world of nineteenth century evangelicalism, especially the social networks of the East coast, the major cities, and the connections with England. After meeting the major players and tracing the connections, the reader gets a good sense of what kind of people liked this kind of music. They were such solid Christians that it makes you want to like their songs even if they’re not to your taste. Blumhofer also analyzes the Crosby corpus thematically. Most of the songs are about one of five themes: Salvation, consecration, service, heaven, and singing. Round and round these themes Crosby went. Hymn-writers like Wesley and Watts worked with a much larger core of doctrinal themes, and were far more attentive to the details of Scripture’s own phraseology. Their hymns are actually Bible studies, and to sing one with understanding is to learn a lesson in Scriptural interpretation. That close engagement with the words of Scripture, and the attendant intellectual stimulation, is (with a few notable exceptions) absent from Crosby’s hymns. She composed her lyrics more impressionistically, evoking emotional states and using those as the lens through which biblical truths were to be contemplated and appropriated. All the writers of the gospel songs were trying to do exactly that; Crosby excelled them all.